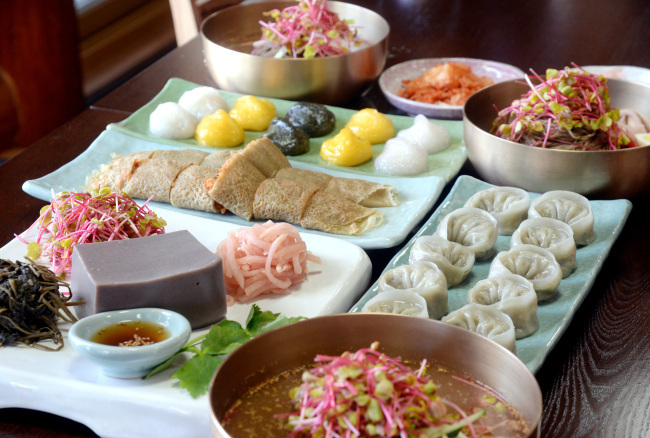 [PyeongChang 2018] For those heading to Gangwon Province, check out The Korea Herald's list of must-eat local dishes. The 2018 PyeongChang Winter Games are just five days away, and cities throughout Gangwon Province are bustling in preparation for the biggest event of the year. About 390,000 foreign visitors are expected to come to Gangwon Province during the Olympic Games, according to Yonhap News Agency. For newcomers to the province, following is a list of must-eat dishes in Gangwon Province that you won’t want to miss. Bongpyeong, a small town located in the county of PyeongChang, Gangwon Province, is rumored to produce the best quality buckwheat in the country. Celebrated Korean writer Lee Hyo-suk, who was born in Bongpyeong, wrote the famous novel “When Buckwheat Flowers Bloom” based on the beauty of the vast buckwheat field in his hometown. The town holds its annual buckwheat flower festival to commemorate the late author every September. “Many people often mistake buckwheat as an autumnal food due to the festival,” Hong Soon-kwon, an owner of buckwheat restaurant Scent of Buckwheat Flower told the Korea Herald. The restaurant features five different dishes based on buckwheat, including buckwheat noodles, gelatin (or mook) and crepes. Besides Hong’s restaurant, about 10 local eateries located in Bongpyeong are noted for serving buckwheat dishes. About a 10-minute drive from the Gangneung Ice Arena, Chodang Sundubu Village features a cluster of restaurants that serve the special bean curd dish. “Only a few natural ingredients, including fresh soybeans and seawater from the East Sea, are used to make the tofu,” one restaurant owner said. The soft tofu boasts a milky texture and pure flavor, but you can add soy sauce according to your preference for more flavor. Aside from soft tofu, the restaurants also have a hard tofu selection as well. The steaming firm tofu lends a unique chewy texture and rich taste when it is served straight from the kitchen. If you are a potato lover, you’ve come to the right place. Gangwon Province is the largest producer of potatoes in Korea, as its high altitudes and swinging daily temperatures make for the perfect conditions for the crop to grow. 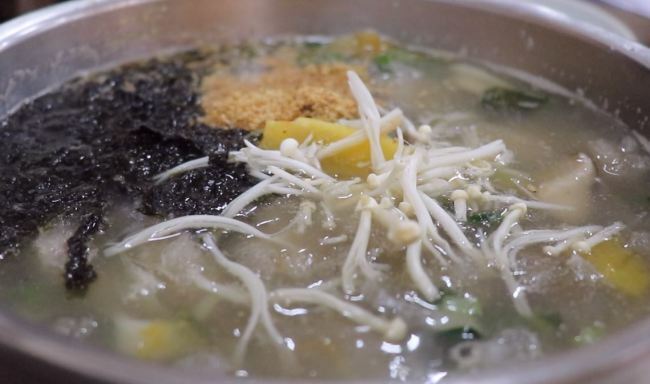 To match its reputation, cities in Gangwon Province offer various dishes based on the local specialty, with potato dough soup among them. The small, starchy potato balls and boiling seafood broth make for a good combination, while kimchi adds an extra kick. The rough texture of the potato balls might be unusual for first-timers, but once used to it, you will enjoy the chewiness of the ongsimi. Savory potato pancakes and sweet potato songpyeon are also recommended if you visit the restaurants specializing in potato-based dishes.